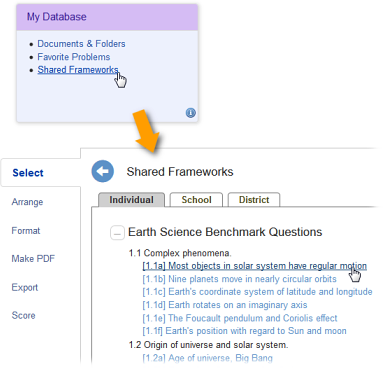 Problem-Attic has tools for aligning questions to state standards, for doing curriculum development for your school or district, and for adapting the database to meet your own personal needs. One of the tools which is available to all Problem-Attic users is called the Framework Builder. A framework is like a custom database module. You can select questions from it just like you do with the databases built in to Problem-Attic. Also, it can have a hierarchical structure, so it can be designed around learning objectives, a scope-and-sequence, textbook chapters, etc. A framework is easy to create and share, because it makes use of methods that you are probably familiar with already, such as adding problems to documents and organizing documents into folders. We won’t be covering those topics here, but you can learn about them in Problem-Attic’s online help. When we go through the steps of building, sharing & managing frameworks, we will assume that you have made at least a few documents and you know how to switch between the Create and Organize pages. The Framework Builder does not require you to put documents in folders, but it works best if you do. Folders are the secret to the hierarchical structure. Without them, your framework will be a flat list of document titles. You do not need a subscription to create or share a framework. You can make your framework available to as many as 10 other Problem-Attic users by entering their email addresses. 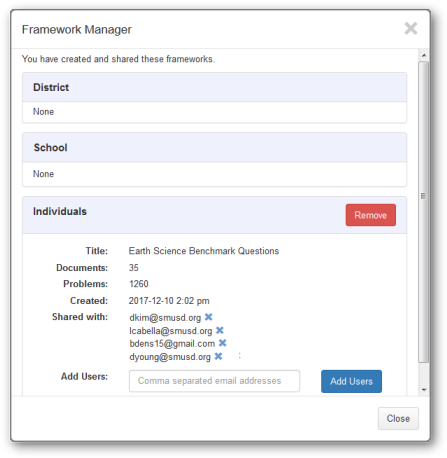 If you do have a subscription, the Framework Builder gives you an option to share with other teachers at your school. You can also do district-wide sharing, if there is more than one subscribing school. You should think of a framework as a “snapshot” of certain folders, documents and problems. Once you share the framework, it will not change, even if you delete documents or move them into different folders. However, you can update the framework at any time or stop sharing it by following the steps below. The other tools for curriculum development are called My Database and Document Sharing. Unlike a framework, which is static, they reflect the changes you make to documents and may be considered “live”. See this overview to understand how the tools differ from one another. Here are the steps for creating and sharing a framework. Go the Organize page in Problem-Attic. If you have organized your documents into folders, right-click the one you would like to turn into a framework. All folders and documents inside of it will be included. If you have not organized documents into folders, right-click the folder at the top, which is called “All Documents”. Choose Framework Builder from the pop-up menu. In the Framework Builder dialog, the title will match the folder that you clicked. You can change the title if you like. Choose the type of sharing. Individuals: Share the framework with up to 10 registered users of Problem-Attic. Enter the email address of each user, separated by commas. Note: For individual sharing, you can select the option “Include me in the list” to see your own framework. This is an alternative to entering your email address. Click Continue. The framework will now be visible to the Problem-Attic users with whom you shared it (and yourself, if you chose that option). To open the framework, go to the Create page and click the Select tab one or twice until you’re at the top level, which has the nine panels. On the bottom-middle panel, which is called My Database, click “Shared Frameworks”. You can drill down into the database and select problems in the usual way. 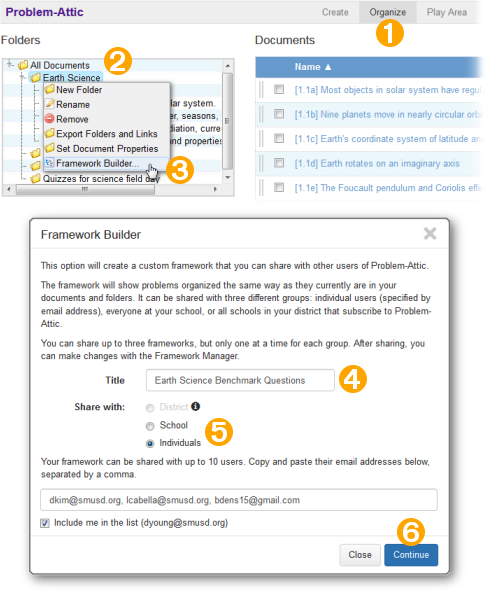 Problem-Attic lets you create up to three different frameworks, one each for individual, school and district sharing. If you re-run the Framework Builder, and choose the same kind of sharing as before, you will replace or effectively update the existing framework. After you’ve created a framework, you can change who it is shared with, or remove it entirely from “My Database”. To do that, go back to the Organize page and click the Framework Manager button. In the Framework Manager dialog, you will see information about each of your shared frameworks and buttons for removing them. Also, if you have done individual sharing, you will have an option to add other Problem-Attic users (up to 10 total) and to remove one or more of them by clicking the x-button next to their email address. If you are aligning questions with state standards, then you will almost certainly want to include objectives in your framework. These are the short codes, like “Math AF.4B” or “Std 7.3-a”, which show up on Problem-Attic’s answer keys and Score tab, and which may be exported to other programs. On the Properties tab in the Editor. When you type an objective here, it is physically attached to a problem. It will be the default when the problem is selected for a new document, and it will always travel with the problem, through a shared document (public link) or framework. On the Arrange tab > Problem Details. When you type an objective here, it is treated as an override. It is attached to the problem for one particular document. If you share the document (through a public link), the objective will follow, but it will not be included in a framework. [5.04A] Identify prime and composite numbers. When you select a problem from the container, the code inside the square brackets automatically becomes the objective on the Arrange tab > Problem Details. As we noted above, a framework is a custom database module, and it works just like those built in to Problem-Attic. That means, when you create a framework, you can take advantage of method #3. We strongly recommend it. The physical attachment of objectives in method #1 is time-consuming, because you have to edit every problem, and ultimately it is less flexible. With the virtual method, you can assign new objectives to problems simply by moving them from one document to another or by changing a single code at the document level. The document name is what shows up in the drop-down menu at the top of the Create page, and in the list of documents on the Organize page. This may be different from the title of a document. The title is what actually appears on a test or worksheet, or at the beginning of an online test; it is what students see. By default, the title is the document name, but you can change that on the Format or Export tab. If you put a code in square brackets at the beginning of a document name, then, when you run the Framework Builder, that code will automatically become the objective for all problems in the document. It does not matter if problems have different objectives attached to them through the editor or on the Arrange tab. You do not need to remove them. In effect, the Framework Builder does a re-alignment. Its objectives become the new defaults. If you like the virtual method of attaching objectives, but you don’t want document names to have square-bracketed codes, there is an alternative. Problem-Attic can add them to document names when you run the Framework Builder. You just have to tell the program what objective goes with each document. That is done with the three-dot Properties button on the Organize page (Document List). At the top of the Properties dialog is a field where you can enter a short coded objective. If you do that, it will have the same effect as if it were in the document name. Note: there’s no need for square brackets in the Properties dialog. Also, if you type a code there and in square brackets in the document name, the latter takes precedence.